A curriculum is more than just a block of subjects or a series of lessons that fulfil the National Curriculum requirements. At Falinge Park High School we believe the curriculum influences everything the pupils do: from the moment they wake up in the morning and put on their school tie; the way they conduct themselves on the way to school; the experiences they have of learning both in lessons and in the wider opportunities they benefit from; to learning outside the classroom, through visiting speakers or the extensive trips and visits we offer; to how they succeed post-16 and the choices they make. To provide a supportive transition and build the foundations for the future. 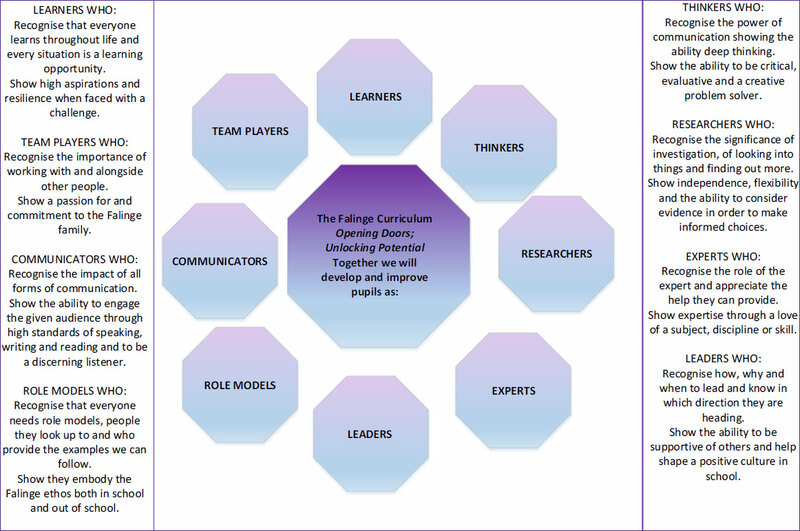 Pupils undertake targeted support within the CALL curriculum to improve their vocabulary whilst reading programmes ensure that all pupils are well equipped to access the curriculum. Pupils study all aspects of the National Curriculum and are given support to help their transition based on their academic or individual needs. Pupils in Year 8 have a wide access to experts from different fields through working with Digital Designers in Residence, educational visits and through active citizenship programmes. Guidance is given to pupils to start thinking about the options they want to take in Year 9. To unlock their potential through the focus curriculum and through channelling a sense of community and citizenship. Pupils in Year 9 follow all National Curriculum areas but focus on a specific area. For example, whilst they study both Geography and History, they may choose to focus specifically on one of those areas and receive an extra lesson in this area. Pupils choose their options in Year 9 as we want to ensure that the breadth of the Key Stage 3 curriculum is not lost and that pupils have a good grounding before they pick their options. All pupils take part in fundraising or change through their Citizenship programme. To develop leadership of learning and become experts in their own specialist areas. We aim to be a school where the curriculum has a soul and that is evident in all our practice.